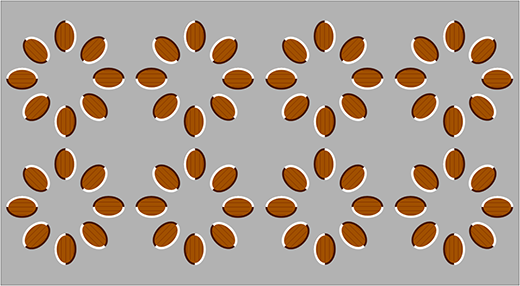 This week's Excel Optical Illusion is a spin on the Swirling Almonds. As long as you move your eyes, the almonds just keep swirling and swirling. No VBA. Just a simple XY (Scatter) type chart. Great effort on your site. I'm an amateur on Excel & came across the stuff that PHD Chandoo posted on his site, & thence here. Tried to add you to my Google reader RSS subscriptions, but doesn't seem to work. Any ideas? If you are seeing a page with crazy characters, just copy the full URL at the top in the address bar. Then go to Google reader and click the Add A New Subscription button. Paste the URL in there and you are good to go. P.S. I realize it's the shape of the nut that makes the illusion work. I don't think the shape of the nuts is that important. It is more the Shading of the nuts. To prove this I copied the Picture and copied the left 2 nuts and pasted them accoss the others. The effect is still there but very weak. This page contains a single entry by Daniel Ferry published on June 4, 2010 9:52 PM. Excel Business Application Development Services was the previous entry in this blog. Excel VBA Shortcut Range References is the next entry in this blog.